We all grew up drinking cow’s milk which was told to be the most nutritious staple food. The promotion of cow’s milk as the go-to healthy source of protein and nutrition has been there. In the current scenario, it does not hold as reliable as before. Several studies are reporting that the cow’s milk that was once the most nutritious source has now become decidedly less nutritious. This is a result of adulteration taking place big time. The animals are facing a lot of cruelty, and if the cow’s milk is extracted from these animals, we are at more risk. Cow’s milk possesses an excellent nutrient characterization. It is not only rich in high-quality protein but also is an essential source of vitamins and minerals, like calcium, phosphorus, and Vitamin B. A single cup of cow milk measured by 250 ml of whole milk provides up to 146 calories, 8 grams of protein, 8 grams of fat, and 13 grams of carbohydrates. The world is eventually moving towards consuming an increasing number of alternatives to cow’s milk. Especially for people who are allergic to dairy, lactose intolerant, or have a feeling that cow milk is merely not a healthy choice. For people who are lactose intolerant, consuming dairy products might induce bloating, diarrhea or gas. The reason is, people suffering from this condition cannot digest lactose, a sugar present in these foods. The plant-based milks that are trending nowadays are much easier to digest, while also being a tastier option comparatively. Non-dairy milks exceed the expectations in taste, variety, and nutrition. They are making a transformational development towards dairy-free milk less troublesome for the stomach. This is a huge benefit for people with non-celiac gluten sensitivity or celiac disease. If you have one of these issues, the answer is almond milk or soy milk. The milk lanes in supermarkets are now filled with various options like unskimmed, skimmed, toned, double-toned, and what not. It is natural that one might get confused with all these choices available and find it hard to make the best choice for themselves and their family health. The difference between these variants is the cholesterol content. Plant-based milks are the best alternatives because their sources are free of cholesterol. Cow’s milk is not considered a suitable choice for everyone. However, there are several reasons for which you may choose to sacrifice cow’s milk, including allergies, ethical reasons and concerns over potential health risks. Dietary restrictions: Some people by their own choice exclude animal products from their diets for moral or health reasons. Vegans are an excellent example of this category of people as they eliminate all products that originate from animals, which includes cow’s milk. 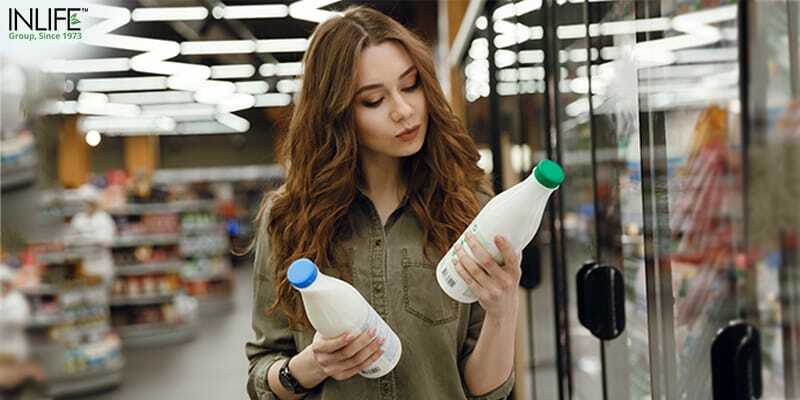 Potential health risks: Some people voluntarily choose to avoid dairy milk due to concerns over possible contaminants like antibiotics, pesticides, and hormones. While making your choice, be sure to stick with unsweetened varieties and avoid added sugars. Besides, it is necessary to make sure your non-dairy milk is fortified with calcium and vitamin B12. There is not one milk that can be called ideal for everyone. The taste, nutrition, and cost of all these alternatives can fluctuate considerably. Hence it might take some time to find out the one that suits best for you. Here are a few alternatives for cow’s milk that you could use every day, so you don’t have a feeling that you’re missing out on the taste and nutrition. The best part is, most of these can be easily prepared at home. The most easily accessible alternative to cow’s milk in the market is Soy Milk. It is not only rich in protein but also contains lesser fat than dairy milk. Medical reports suggest that compounds similar to the female hormone estrogen called isoflavone compound are present in soy milk. It has the power to aid the lowering cholesterol, overcoming of menopausal symptoms and promotion of bone density. Soy milk is basically made either with soybeans or with soy protein isolate. It often comprises of vegetable oils and thickeners that improve the taste and texture. It also typically has a smooth and creamy flavor when compared to cow milk. Nevertheless, the taste can differ between brands. It serves as the best option as an alternative for dairy milk in delicious dishes, or with coffee, or with cereal. One single cup of unsweetened soy milk, measured by 250 ml, contains 80 to 90 calories, 4 to 4.5 grams of fat, 7 to 9 grams of protein and 4 grams of carbohydrates. Soy milk is considered as the best substitute for cow’s milk because of its similarity in protein content. It is also a healthier alternative because it contains just half the amount of calories, carbohydrates and fat when compared to the dairy counterpart. 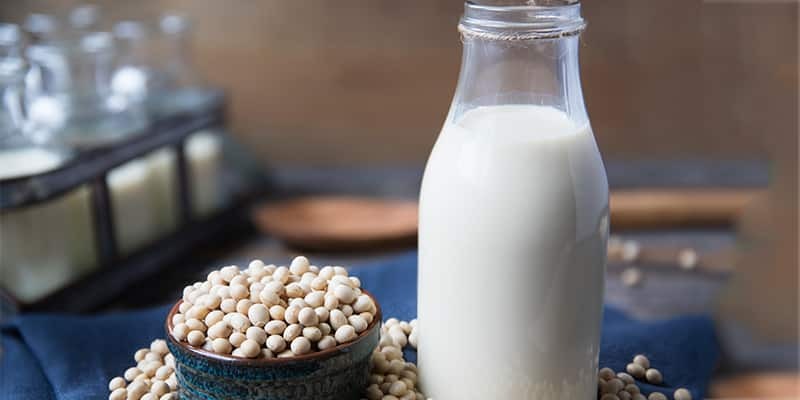 Soy milk is one of the few plant-based origins for attaining a comprehensive set of proteins in your diet. It not only contains all the quintessential proteins but also serves as a good source of essential amino acids. These are the nutrients that cannot be produced by the human body and have to be procured from the diet. Soy milk has a mild and creamy taste. It is the most alike in nutrition to cow’s milk when compared to its other counterparts. Although soy milk is usually seen as a controversial food, drinking soy milk in regulated amounts is implausible to give rise to any harm. One product that is consistently gaining momentum all over the world as an alternative for cow’s milk is almond milk. It contains the least level of calories and saturated fat. It can not only be used as a dairy alternative for a multitude of preparations but also is being used more often in the patisserie and confectionary set-ups. Almond milk is made either with almond butter and water or whole almonds. It has a mild character and has a slightly sweet and nutty flavor. Interestingly, because of this nature, it is usually added to coffee and tea, mixed in smoothies and used as a replacement for cow’s milk in baked goods and desserts. A single cup of unsweetened almond milk contains, measured as 250 ml includes 2.5 grams of fat, 30 to 35 calories, 1 gram of protein and 1 to 2 grams of carbohydrates. When analyzed concerning cow’s milk, it comprises a lesser quantity of calories and less than half of the fat. It also has a significantly lower number in protein and carbohydrate content. Additionally, almond milk is also an organic source of Vitamin E, a combination of antioxidants that further preserve the body from substances causing diseases known. 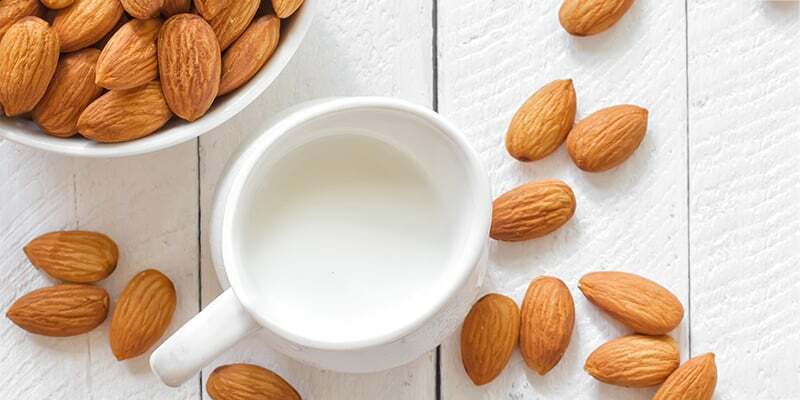 On the contrary, almond milk is a significantly less intense origin of the useful nutrients obtained from whole almonds, especially concerning protein, fiber, and healthy fats. All this is due to almond milk being made up of water abundantly. Apart from having a light, sweet, nutty flavor, almond milk is low in calories, carbohydrates, and fat. Have you ever wondered how easy it is to prepare plant-based milk at home? Sounds weird right? It is extremely easy to make cashew milk at home. Yet people tend to assume that there aren’t alternatives to dairy milk that are readily available. Cashew milk is made from a fine blend of cashew nuts or cashew butter and water. It is a rich and creamy extract that has a delicious and subtle nutty flavor. It is an excellent ingredient for thickening smoothies or as a substitute for cow’s milk in desserts and as a creamer in coffee. 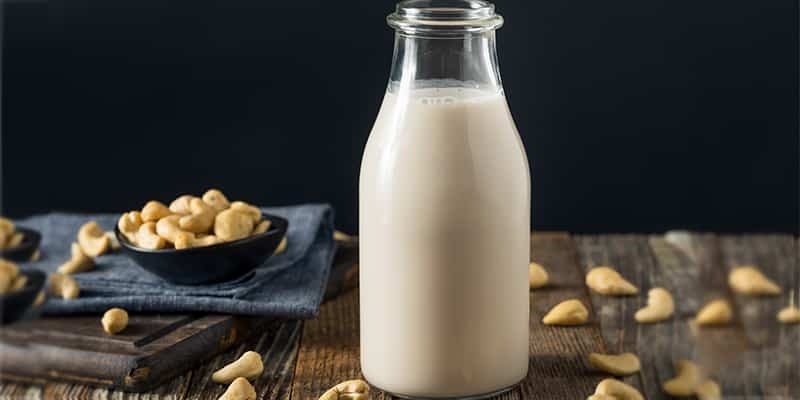 Store bought cashew milk which is unsweetened claims to have 60 calories per 1 cup which is 250 ml, but ideally, cashew milk which is made from 1/4 cup of cashew will contain approx 190 calories. Cashew milk contains less than one-third of the calories in cow’s milk and half the fat. This is significantly less protein and carbohydrates. With only 25 to 50 calories per cup, unsweetened cashew milk is a fabulous, low-calorie substitute for those looking out to overcome their total daily calorie intake. When this milk is purchased from a good brand, it has fewer calories and is a good alternative for those who can’t have cow’s milk. Cashew milk contains a rich and creamy taste and is low in calories, carbohydrates, and sugar. On the disadvantage point of view, it provides very less protein. It might not be the best option for those who hit the gym frequently and need a lot of protein in their diet. When you’re a downie, eat a brownie! Even if your idea about going vegan means giving up on your favorite ice cream or other desserts, don’t worry. Coconut milk has your back with your vegan diet. While it might seem less impressive that some dairy-based desserts can be prepared with almost any other non-dairy alternative. Given the difference in taste, coconut milk is the handyman, since it gets the closest in giving you that dairy flavor and texture. Coconut milk is rich in potassium and mixes well with almost every dish. As coconut milk tends to be thick, we suggest diluting a quarter cup of the milk with 1 or 2 cups of water according to your taste. Coconut milk is made from the water and the white flesh from brown coconuts. Coconut milk has a creamy taste and a delicious but very subtle coconut flavor. A single cup of coconut milk, measured as 250 ml, contains 45 calories, no protein, and almost zero carbohydrates. 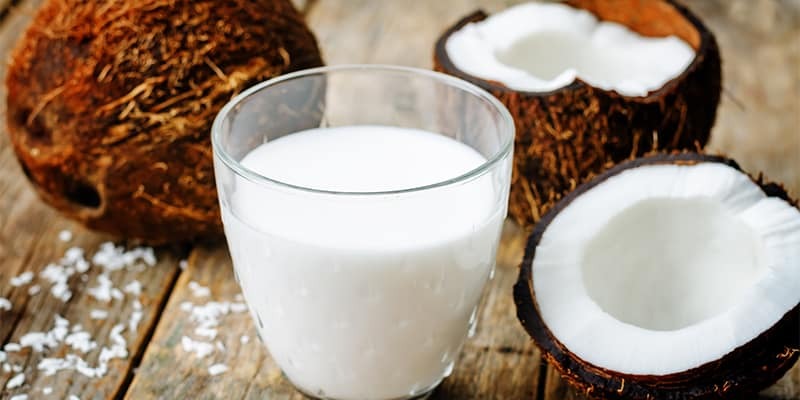 Coconut milk contains hardly one-third of the number of calories in cow’s milk, and half the amount of fat and a significantly lesser amount of carbohydrates and protein. Although cow’s milk contains a lot of nutrients in itself, coconut milk can be replaced but with lower calories and lesser protein. Coconut milk has the least quantity of protein and carbohydrate content of all the non-dairy milks. It might not be the best option to consider for people trying to gain mass or work out to bring their muscles out but suffice as an excellent substitute for those looking to reduce their carb consumption. Every diet that goes for reducing weight surely has oats in it. There are two reasons to this – it is low in fat content, and is an excellent source of various nutrients all in one nutshell. Rather an oat flake! Oat milk is undoubtedly high in both fiber and protein. You could always have it with your bowl of corn flakes for a nutritious breakfast. But little did anyone know that it is also another alternative for extracting milk that substitutes the regular dairy milk. Oat milk is naturally sugary in taste and smooth in flavor. It can be used to cook in the same way as cow’s milk, and as a cherry on the cake, it tastes great both with cereal or in smoothies. 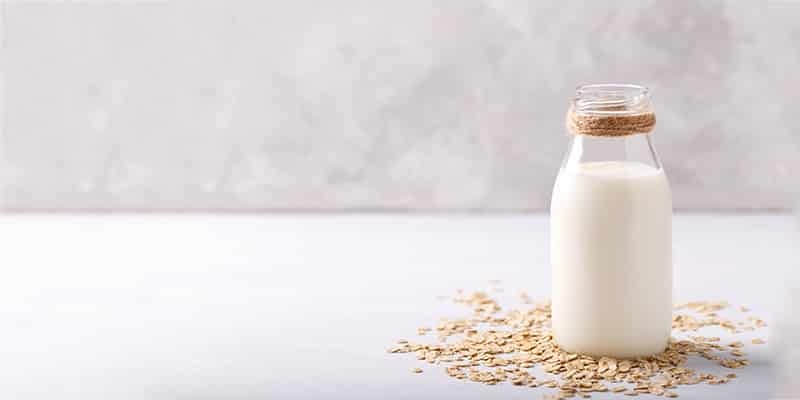 A single cup of oat milk contains 4.5 to 5 grams of fat, 140 to 170 calories, 2.5 to 5 grams of protein and 19 to 29 grams of carbohydrates. Oat milk comprises of a similar amount of calories as cow’s milk. It is also a rich source of carbohydrates and about half the amount of protein and fat. It is also relatively cheap and easier to prepare at home. Oat milk has a sweet and mild flavor. It is not only high in protein and fiber but also high in carbohydrates and calories. Oat milk contains beta-glucan, which helps lowering cholesterol levels and blood sugar levels. The foods that you eat straight-away impact your digestive well-being which is the root for your overall well-being. In order to keep your stomach satisfied, it is essential to eat easy-to-digest foods. That’s another triumph for plant-based milks against the normal cow’s milk available. 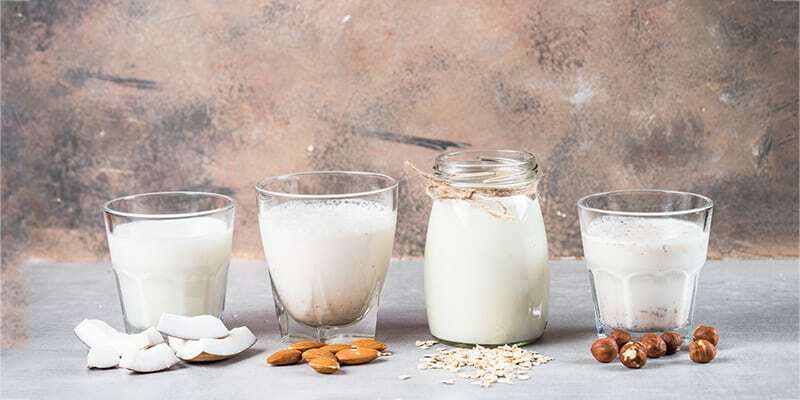 Even if you’re not lactose intolerant, the consumption of non-dairy milk alternatives like soy, almond, coconut or oat milk are often considered as better options to maintain digestive health. Cow’s milk has its benefits, but people who want to take an alternative pathway can choose the various options mentioned in this article. This entry was posted in Diet & Nutrition, Digestive Health, Health and tagged alternative milk, coconut milk, plant-based milk, protein, soy milk. What Are The Effects Of Heat On The Body?